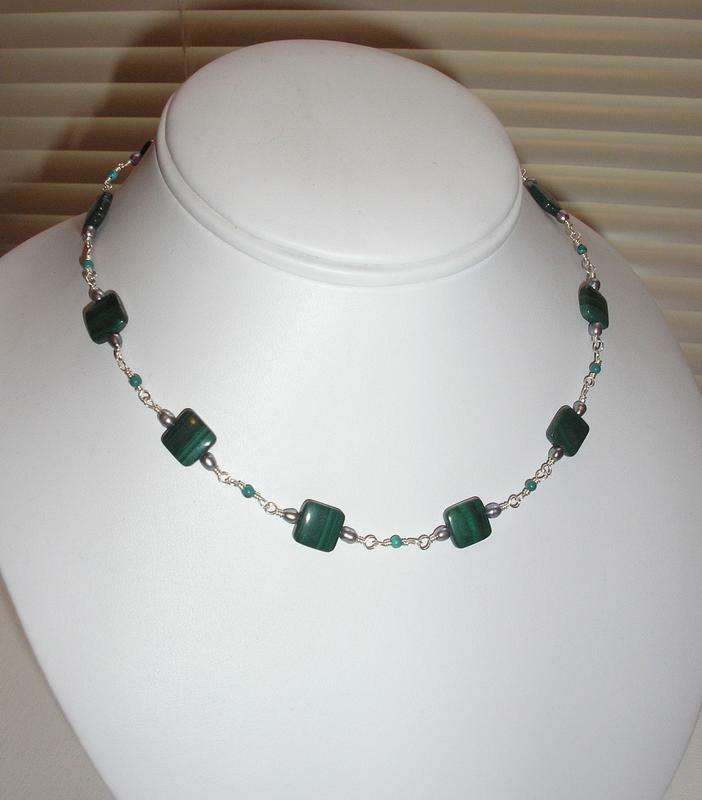 I found some lovely square shaped green malachite beads, and decided the stones were pretty enough on their own to warrant a simple chain bead necklace design. 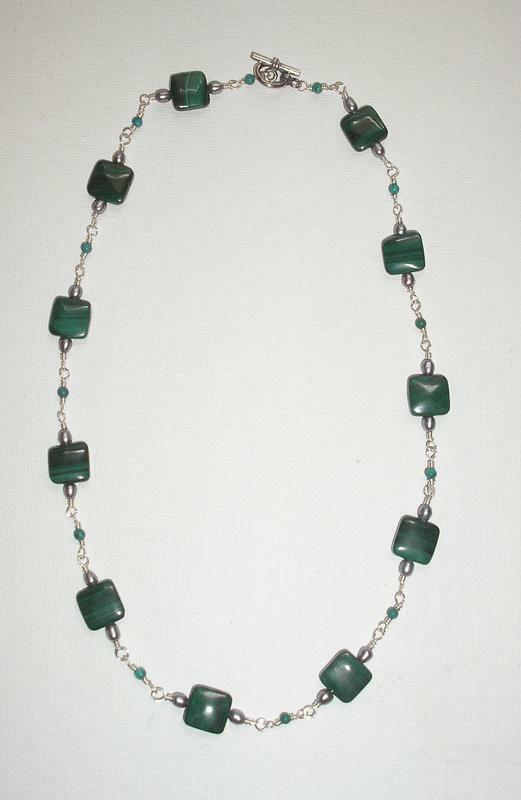 I set the green malachite off with some tiny silver seed pearls, and some green turquoise beads. You can vary this design easily by choosing three types of beads in any complementary or contrasting colors and sizes. 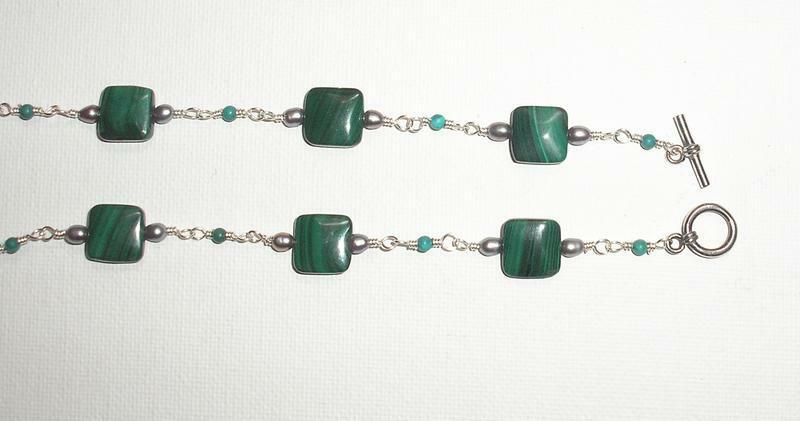 1 strand of malachite beads. I used square beads, but any beads of your choice will do. 1 strand of tiny accent beads. I used 2mm turquoise round beads. Try crystals, seed beads, silver accent beads, or any small beads of your choice. Coil of sterling silver half-hard wire, fine gauge to fit through bead holes. I used 24G wire. 1 sterling silver toggle clasp. 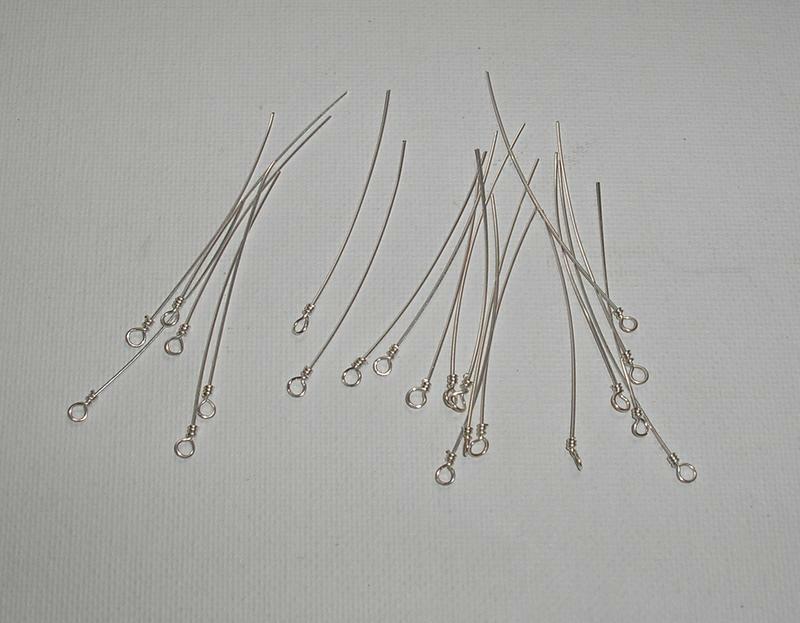 We will use some sterling silver wire to create the start of each bead link component. This "assembly line" process will make it easier and faster to put your necklace together. Cut several inches of wire the same length. 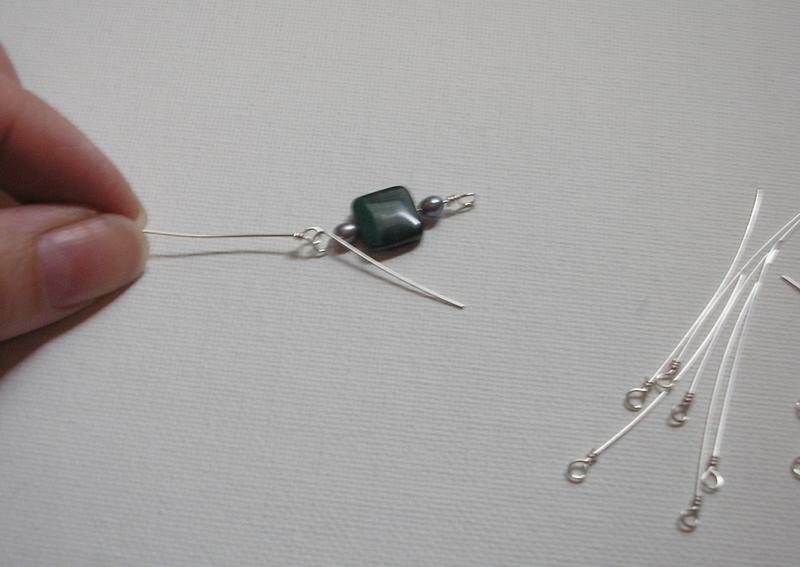 Start with about 15 sets of wires, you can cut more once you have gauged the overall length of your bead components and necklace. Using round nose pliers, make a loop at the end of the wire and then close the loop and wrap it around the stem several times (making a closed loop). Repeat this process for each wire, and make a closed wire loop at the bottom one each one. If you need help learning to make a loop, follow these instructions. Next, slide the beads onto a wire stem, and before closing the other end, attach it to the next link in the chain, then close the loop. In this manner, you will connect each bead component to the next in the chain. 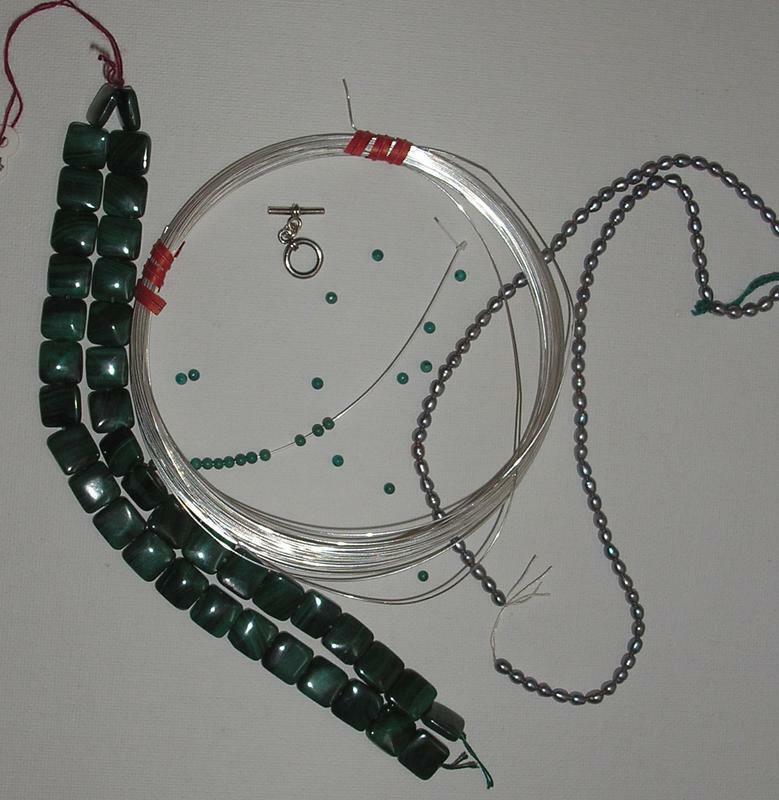 Using a closed wire wrap loop to make a connected beaded chain, (see instructions), connect the beads together until you reach the desired necklace necklace length. For my design, I alternated the following bead components to make my design. Alter this if you like to make your own unique design. I simply alternated the design; every other bead component is one malachite bead, one turquoise bead, one malachite bead, and so on. Once your necklace is the desired length, you will attach the clasp to either end on the last link in the chain. 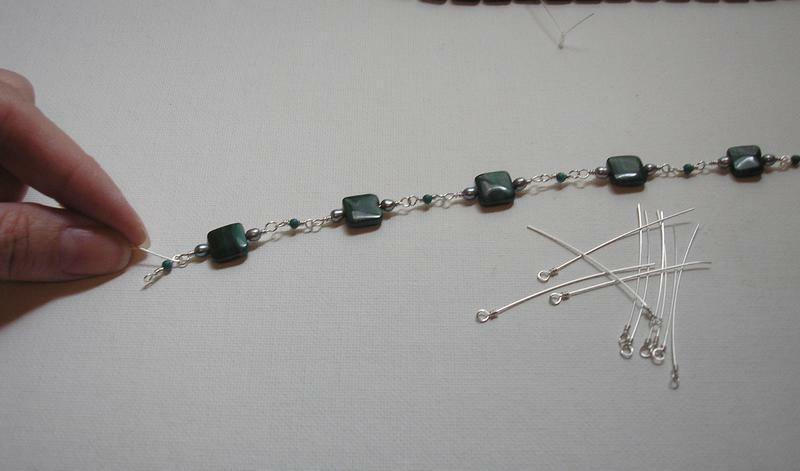 Just attach the components by sliding them onto the wire loop at one end of your bead, then make a closed wire loop. 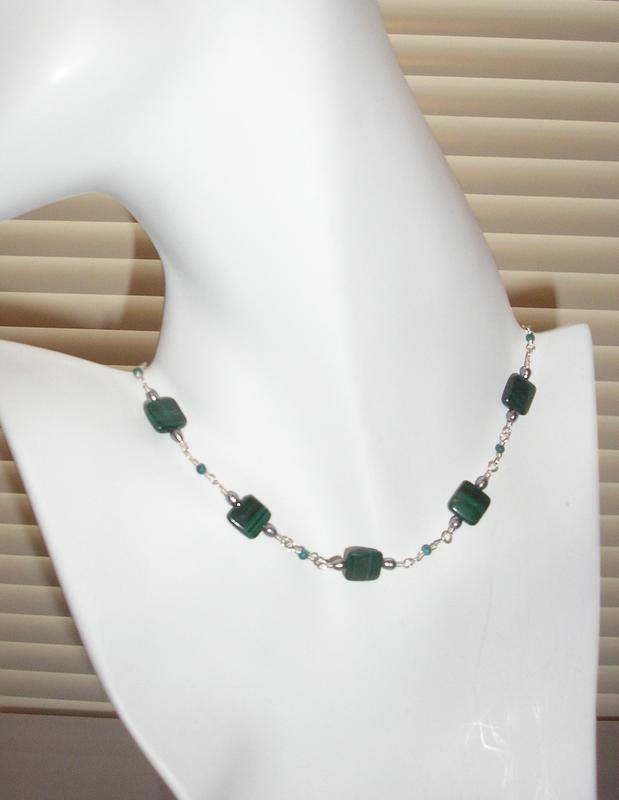 That's it, your new malachite bead necklace is ready to wear! Tip - If you have beads left over, why not make a matching bracelet?